The Ram Rumble Bee has recently appeared at the 2013 Dream Cruise car show in Detroit, Michigan. It is the first concept vehicle that uses an insect theme to it. The knob on the transmissions 8 speed gear has an actual bumble bee embedded in amber. This truck first appeared 10 years ago. Constant improvements have been made to this concept truck. The Rumble Bee concept has long existed dating back to two previous high performance trucks. The original Dodge Super Bee was a muscle car in the 70’s, while the limited edition Ram 1500 Rumble Bee launched in 2003. The truck was bright yellow with black stripes and a bee logo on the back of the bed. This thing is loaded with power with its 395 horsepower, and 407 pounds of torque. The concept trucked is based on a standard Ram 1500 R/T with two doors. 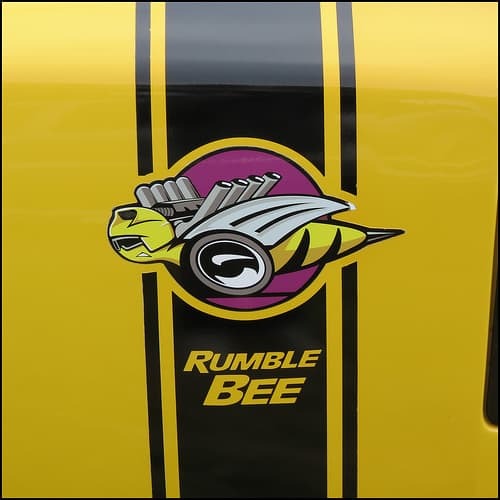 The Rumble Bee has a custom pearl yellow paint job featuring black stripes and bee decals. The color is obviously Drone Yellow. The Ram logo is blacked out. The cargo bed is covered with a yellow tonneau cover. There is a spoiler at the back of the truck. The hood features hood scoops and the front features an integrated splitter. The truck on the inside is black leather and bright yellow stitching. The seat backs are custom embroidered with the Rumble Bee. The seats surfaces are a yellow/black honeycomb fabric. The engine on this monster is spectacular featuring a 5.7-liter, 395-horsepower Hemi V-8. Mopar offers a body kit, cold air intake and special exhaust on this truck. The truck features 24 inch wheels. The Rumble Bee also offers an exhaust bypass and can be activated by a button on the dashboard. The 8 speed automatic transmission can shift the rear wheels to a 4.10 differential. The interior also features the rumble bee logo and lettering on the floor mats and doors. The highlight is still the obvious real drone on a honeycomb background. 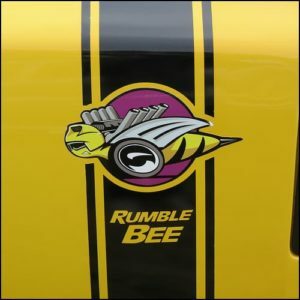 The rumble bee is a very cool bee featuring a helmet, a hemi, and wheels. The black background is honeycombed. The wheel rims can also be blacked out as can the tail lights. This truck does not fall short of expectations and certainly doesn’t lack on individuality or character. There are many custom options that can be added to this truck. This truck doesn’t lack quality or style and is a favorite even in concept.